Define Payment Term Types For Your Business. Have you ever needed to provide a customer with extended Terms of Payment on a large order? Do you have a major customer who requires Prox dating or multiple payments for stocking orders? When rolling out a new product, do you want to allow your customer to pay for new stock over 3 or 4 months? With Kore's FlexTerms enhancement for DataFlo, you can do all this and more. Due Date and Discount Date on a selected day of the month. Specify a "Cut-Off" day of the month for rolling due dates to the next month. Define the number of payments for each Terms Code. Define the percentage of the total for each payment separately. Define the Due Days and Discount Days for each payment. 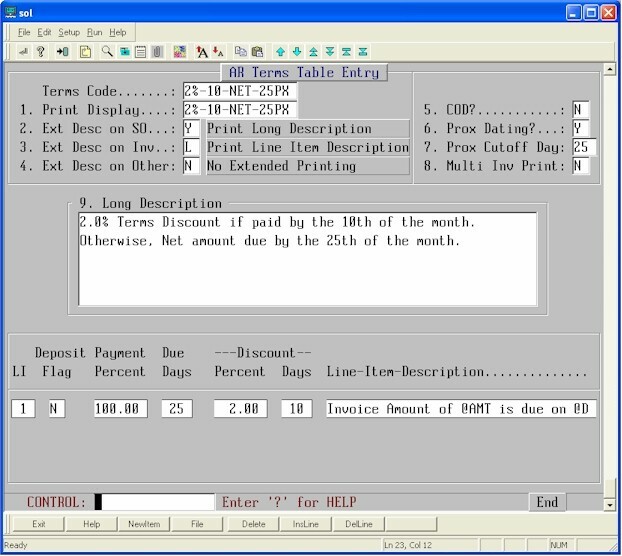 Print the detail of payments (with Due Dates, Discount Dates and Amounts) on each Invoice in your own defined format. Print a single Invoice showing all payments due, or print an Invoice for each due payment - selectable for each AR Terms Code. Supports baseline Deposit logic for the first payment of multiple payments. See Multiple Payment example here. Define the text to appear in the "TERMS" box of baseline documents. Define an extended, free-form text description of the Payment Terms which can print in the Comments section of each document. Print the actual Payment Amount(s), Due Date(s), Discount Date(s), Discount Amount(s) and/or Discounted Amount(s) Due in the Comments section of AR Invoice documents using substitution tags (e.g., @AMT, @DUE.DATE, etc.). 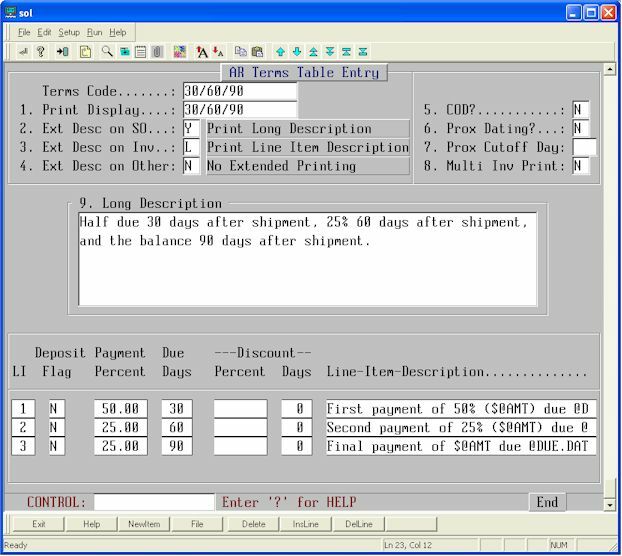 Select which type of Terms description should appear on Sales Orders, Invoices, and other documents (Shippers, etc.). The standard DataFlo AR Aging Report works without modification with the new payment terms types. Click here to see an example. If you would like to create electronic PDF versions of your DataFlo Forms or Reports, take a look at Kourier Forms Manager and Kourier Publisher. If you would like more information on this enhancement of DataFlo, contact us today.